Considering the other DS titles doing better than it on that list, yeah, it's a pretty decent start. I know the Best Buy near my house didn't even bother to stock it. I don't think this is the type of title whose sales pick up... At this point those who are going to buy it usually buy it on release. I did my part bought MMSF3 at EB games for $40 bucks it was well worth the money. Same, I haven't seen it at my Walmart or anywhere else other than Gamestop. In fact, I handed in my Black Ace when I beat it to get Red Joker. Maybe that helped a little. I can't get it anywhere to raise the sales :(,so I downloaded it and this is doing a good start,since it's aleready been 2/3 weeks. It's hard to sell well when there is little publicity. This game not being on shelves for very long proves that. And MegaMac, what do you mean "too much of the same?" That's an argument non-Megaman fans use, not the fans themselves! 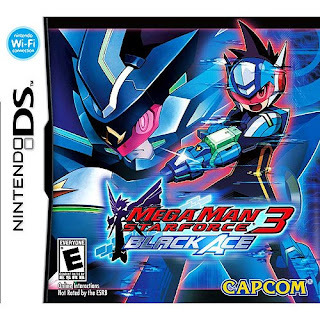 Also, if these games don't sell well, then there won't even BE Megaman games for the time being, period, as Capcom probably knows better than to release a new ZX game after Advent's sales (Despite people like myself wanting a ZX3 more than any other new Megaman game). It's the same reason there was never a Legends 3. In addition, the EXE1 remake - as of now - looks to be half-assed, "more of the same" "plus alpha" PORT. Megaman has gone the way of Castlevania, in that the games are great, but no one plays them. OSS may bring it back up to the sales of the golden age, but even still... I really wish ZXA did well, so we wouldn't have this apparant port situation as our only Megaman fix. And yeah, I do realize how long my comment is for a blog. Sorry Protodude! I can't get over that mmsf3 didn't well in sales. The only places that I have seen sf3 is in game stop, game crazy and frys, I didn't see it at any walmart or target (bastards). For the people who want a sf4 like me it probaly won't happen because how sf3 end, also since rockman exe operate shooting star would propbaly replaace sf series.